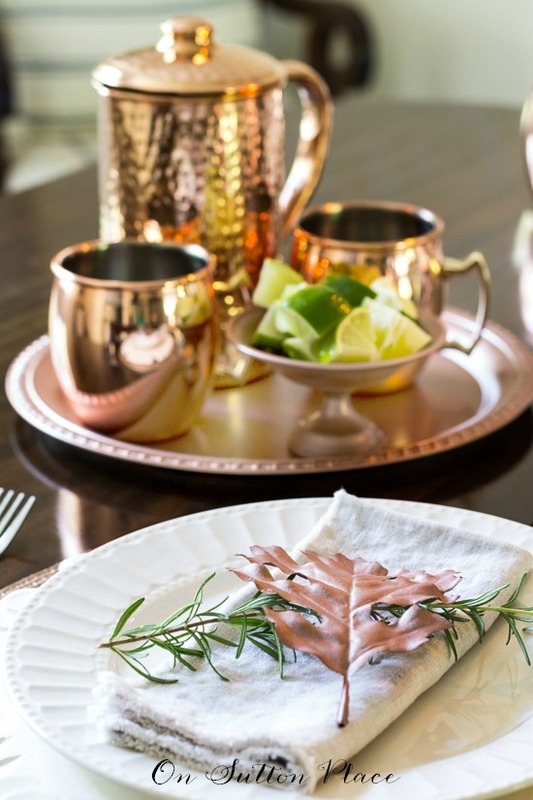 In this post: A Copper Inspired Thanksgiving Table. Ideas and inspiration for your own Thanksgiving gathering. Table settings, place cards, napkin rings, recipes and more! 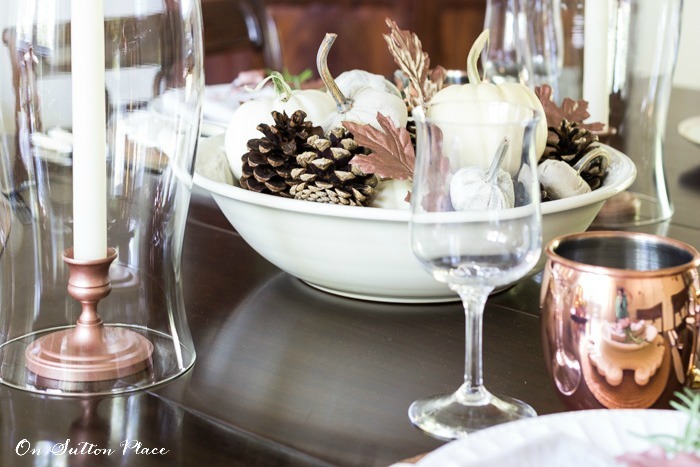 Welcome to Styled & Set and my copper inspired Thanksgiving table! I’m so happy to be joining 29 talented women to bring you ideas and inspiration for your own Thanksgiving gatherings. 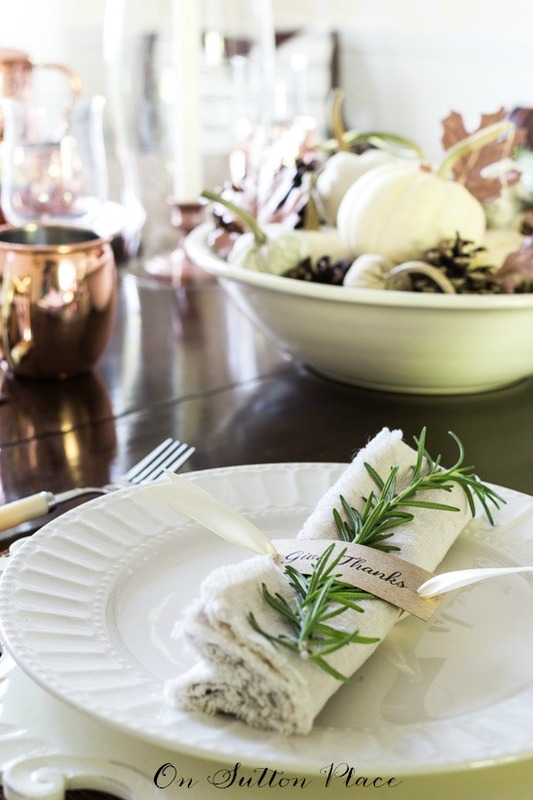 This week we will be sharing an incredible collection of Thanksgiving table ideas. There will be a wide variety of styles…vintage, classic, farmhouse, french country and more. Then, in a few weeks, we’ll all be back with ideas for Christmas. I want to thank my friend Lory of Designthusiasm for rounding all of us up and organizing the tour. I gave you a quick look at this table when I shared my Thanksgiving Napkin Rings. In fact, I have two different ways you can embellish the napkin, but we’ll get to those a little later. First, let’s start with the centerpiece. Along with crystal goblets, I added copper mugs and ivory handled flatware. Now for the napkin details. The first look is pictured below. All I did was lay a sprig of rosemary and a copper leaf on the linen napkin. The second look is a little more involved…but still very easy. I printed little cards with words that represent the meaning of Thanksgiving. A few hole punches and some ribbon then turned the little cards into napkin rings. Click HERE for the complete tutorial and free printable. I’ve never used copper in my decor before and I have to admit that I love it. The one drawback is that real copper will tarnish and it needs to be cleaned. One way around that is to spray paint pieces you already have or inexpensive pieces from thrift stores. That’s what I did with the candlesticks, tray and tiny pedestal bowl. You can’t do it with items you will use for eating or drinking, but it’s a great way to add copper to your decor for hardly any money. And it won’t tarnish! Rosemary Ideas | Recipes, Decor & More! Candlesticks & tray: Thrift store finds that I spray painted. Place mats: I spray painted some old ones I no longer used. Now it’s time for me to turn things over to the other bloggers on the Styled & Set tour. My mouth literally dropped open when I saw some of these posts. They are all, quite simply, stunning. 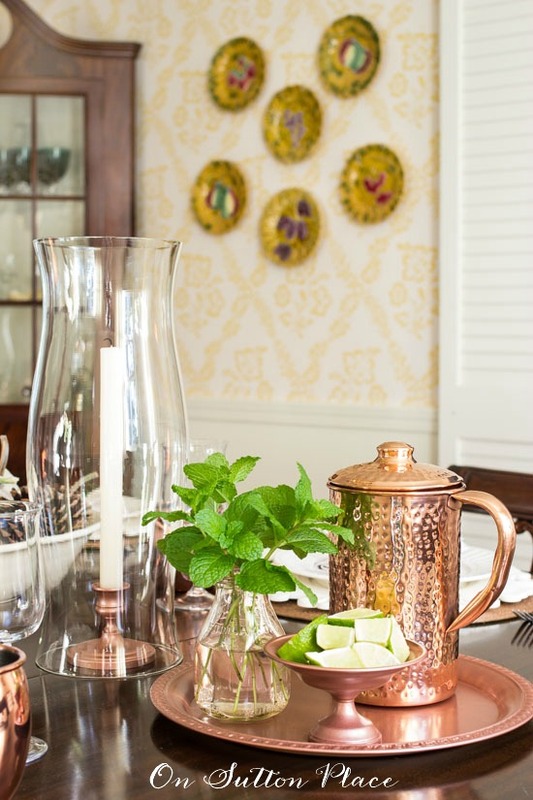 I love your table setting with all the copper, Ann! 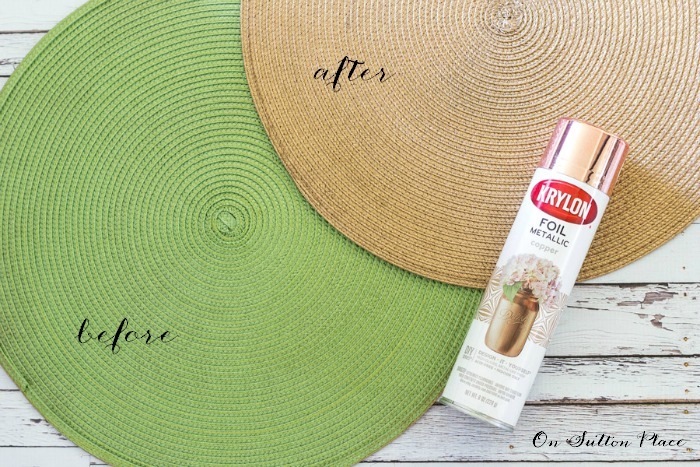 And such a great DIY idea for the circular place mats. I have some of those too and I might just have to do this. White pumpkins, pine cones and rosemary! Beautiful! What an ELEGANT and GORGEOUS tablescape, Ann! The copper accents are perfect. Ann, I can’t believe you’ve never used copper before. It’s perfect. 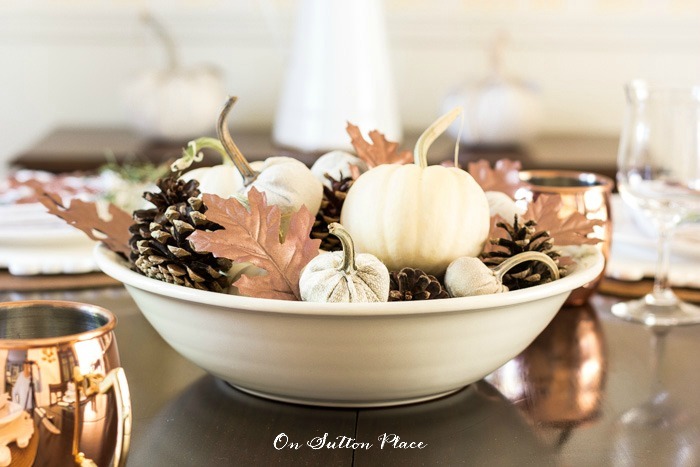 I love especially love the copper leaves and your centerpiece is so fitting. Beautiful! Ann what a lovely, beautiful table! 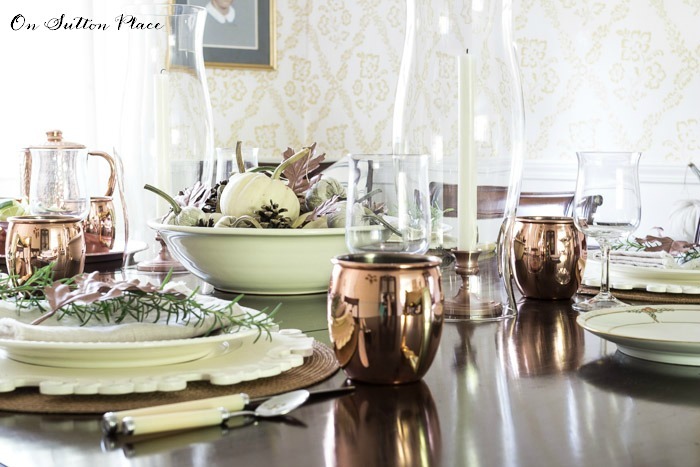 The addition of copper is stunning and perfect for Thanksgiving! I love your table, I also love the copper look also. Thanks for the tips. Beautiful, warm, coppery table Ann! It looks so inviting. Thank you especially for the great idea of spray painting place mats!!! I have those EXACT green place mats, a bit discolored from being out on the screened porch all summer. I’m off to buy spray paint! Your table is lovely! I LOVE the copper that you added. A table that I feel I could do…and thank you for the place card printable. Ann, I am a huge fan of copper and I love how you used it here! I think the copper spray is particularly brilliant! I also love your napkin treatments, and really, I love it both ways! What a lovely table filed with warmth!! Your table is simple but yet very elegant. I love the copper touches you added to your table. So, so pretty! I never would have thought of using copper for my table. This makes a statement!! Oh, Ann! Your table is beautiful and I really appreciate the simplicity of your ideas. Thank you for always keeping it real. 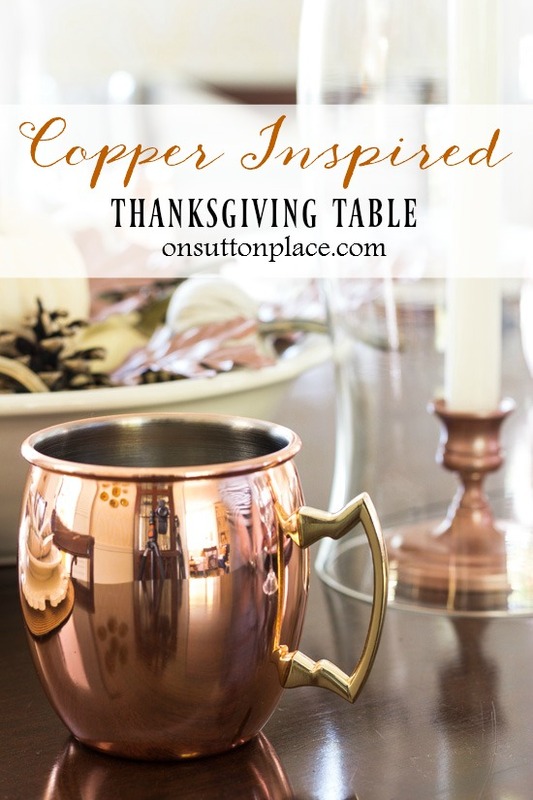 Ann, I have been crushing on copper this fall too and have been using that same metallic spray paint! I just love those copper mugs on your table and how in the world did I miss a recipe from you on how to make a Moscow Mule? Off to check it out! So lovely Ann! I love the warmth the copper brings to the neutral colors – right up my alley! I also love the idea of putting the candlestick in the hurricane. I think I might borrow that idea for my own table! Absolutely gorgeous. Love all the ideas. And I have those same round placemats. I never thought of spray painting them a different color. Gosh, Ann, this tablescape is stunning! I’ve always had a special place in my heart for copper, and this look will elevate my collection to perfection. Love the spray painted leaves and placemats. So simple and yet so elegant. Thanks for a beautiful design! This is so pretty, Ann. I love the copper accents and the spray paint ideas are so pretty and practical. I have some old chargers that could use a new look – copper will be perfect! Thanks for a great post. Hi Ann! I got the link to you over on The Enchanted Home and I’m glad I stopped by. I’m a lover of copper and have used it a lot lately in a recent home renovation. I’m glad it’s back in fashion. Love how you spray painted your placemats, brilliant! Thanks for stopping over Celia and welcome! I’m loving your use of copper, Ann! It’s so nice to see metallics making a comeback. Love the sprig of rosemary on the napkin. Just beautiful. Such a beautiful table, Ann, and not so overly crowded that I can’t see actual people sitting down there to eat! I think copper has been a bit forgotten for some time and I’m hoping we see more of it as its warmth really adds so much. Thank you! This is so pretty, Ann. The copper is shining and reflecting on your table. Funny, I gave away some green mats just like those. Darn, never thought to paint them. Simply stunning! 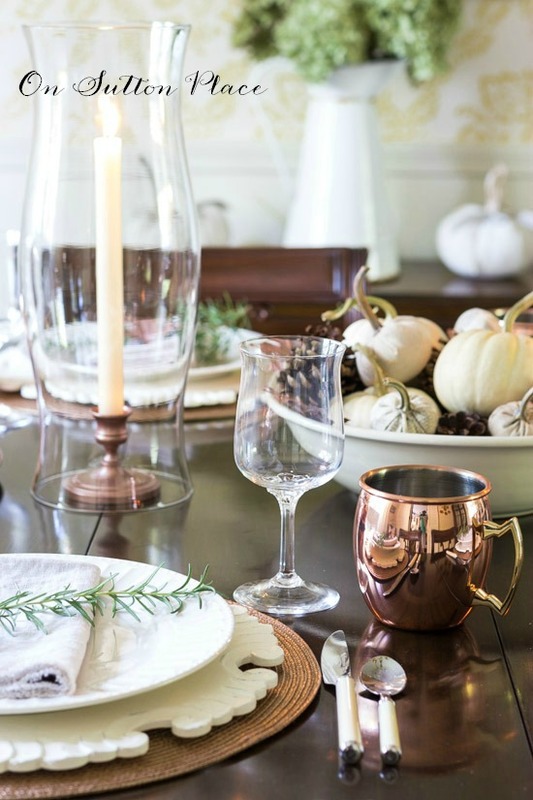 Love the copper accents, makes for a very elegant Thanksgiving table! I loved the mix of copper! I have lots of copper pieces because I used to sell for Coppercraft which was a home party company back in the 80’s before it folded. I need to drag it out and use some of it. Also, I like your blog because I’m not bombarded with moving and blinking ads which distract me and make reading a chore. Thank you and Happy Fall!! Your photos are gorgeous and great minds thinking alike today…I’ve pulled out the copper as well for fall! Ann, Its a pleasure partying with you today! I love the idea of using copper, and spray painting additional pieces is so smart! I love the candlesticks inside the hurricanes and the leaves in the centerpiece dish. Very chic and rustic with that coppery sparkle!